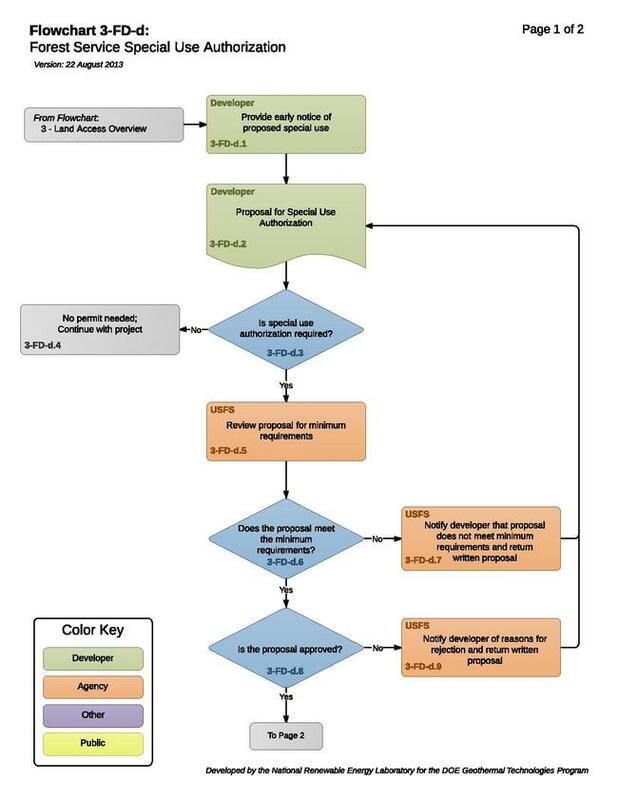 This flowchart illustrates the procedure for obtaining a special use authorization from the United States Forest Service (Forest Service). The Forest Service oversees the special use authorization process through a local authorized official (“authorized official”). A special use authorization is a legal document, such as a permit, lease, or easement, which authorizes use and/or occupancy of Forest Service lands. The authorization is granted for a specific use or occupancy of the land for a specific period of time. The Forest Service has proposed a set of solar directives that will be included in the Forest Service Handbook, section 2709.11, chapter 80. The directives address proposals and applications for and issuance of a permit for construction and operation of a solar energy facility. The proposed directives also address competitive interest in solar energy uses, land use fees for solar energy, and potential effects from solar energy uses on wildlife, scenery, significant cultural resources, and national security. Consequently, this section will be revised for purposes of the Solar Regulatory Roadmap once the directives are finalized. When a developer proposes to occupy and use Forest System lands, they are required to contact the Forest Service office(s) responsible for the management of affected land as early as possible in advance of the proposed use. The developer must file a proposal for the special use in writing to the District Ranger or Forest Supervisor with jurisdiction over the affected land. 251.54(b)(2). The proposal must identify the developer by name and mailing address, and if the developer is not an individual, the name and address of the developer’s agent who is authorized to receive notice of actions pertaining to the proposal. 251.54(d)(1). 3-FD-d.3 - Is Special Use Authorization Required? The Forest Service will review the proposal to determine if authorization is required. 251.50(e). The proposed use is not situated in a congressionally designated wilderness area, and is a routine operation or maintenance activity within the scope of a statutory right-of-way for a highway or the proposed use is a routine operation or maintenance activity within the express scope of a documented linear right-of-way. If the authorized official determines that no special use authorization is required, then the developer may continue with the project. The proposed use does not involve disposal of solid waste or disposal of radioactive or other hazardous substances. 251.54(e)(1). If the request does not meet all of the minimum requirements, then it will not receive any further evaluation and processing. The Forest Service must advise the developer that the proposal does not meet the minimum requirements. 251.54(e)(2). The developer will be notified that the proposal does not meet the necessary minimum requirements, and the proposal will be returned. The developer, if possible, may amend the proposal to comply with the requirements and re-submit it to the Forest Service. 251.54(e)(2). 3-FD-d.8 – Is the Proposal Approved? If the Forest Service approves the proposal, it is accepted as a formal application and will be put through further review. If the Forest Service denies a written proposal they must notify the developer of the reasons for rejection and return the written proposal. There is no person or entity authorized to sign a special use authorization and/or there is no person or entity willing to accept responsibility for adherence to the terms and conditions of the authorization. 251.54(e)(5). After the Forest Service approves the proposal it becomes a formal application and is subject to further review. When the application is accepted for review, the authorized officer must evaluate the proposed use for the requested site, including effects on the environment. The authorized officer may request any additional information as necessary to obtain a full description of the proposed use and its effects. 251.54(g)(2)(i). Federal, state, and local government agencies and the public must receive adequate notice and an opportunity to comment on a special use proposal accepted as a formal application in accordance with Forest Service NEPA procedures. 251.54(g)(2)(ii). 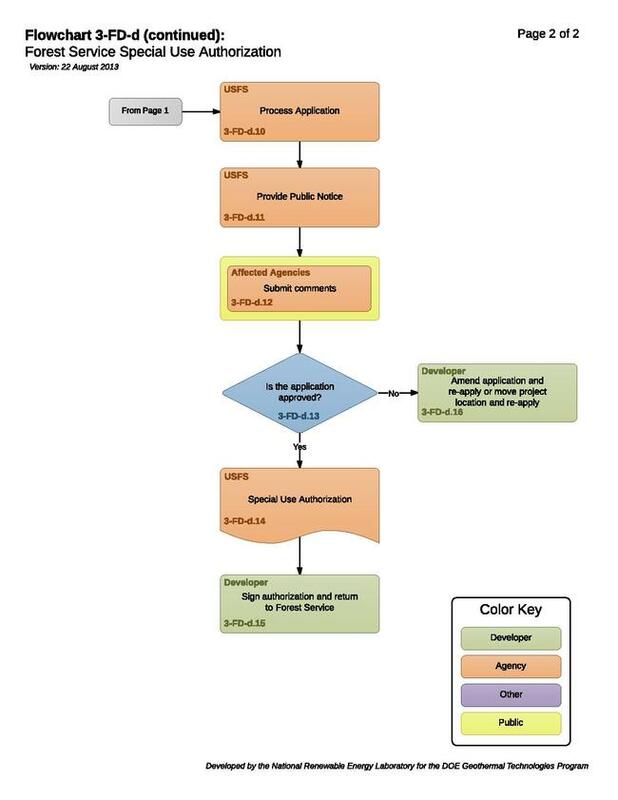 3-FD-d.13 – Is the Application Approved? The Forest Service must decide whether to approve the proposed use, approve the proposed use with modifications, or deny the proposed use based on an evaluation of the information provided by the developer and other relevant information such as environmental findings. 251.54(g)(2). The special use authorization becomes effective only when signed by the developer and returned to the Forest Service. The authorization must be signed and returned within 60 days of its receipt by the developer. Refusal of a developer to sign and accept a special use authorization within the time allowed will terminate the application and constitute denial of the requested use and occupancy. If the application is not approved, then the developer may amend the application pursuant to suggestions provided by the Forest Service. If the application is not approved, the developer may choose to move the project location and re-apply to the Forest Service for special use authorization. This page was last modified on 25 March 2016, at 10:37.